The file Ultimate Dragons v.2.1 is a modification for The Elder Scrolls V: Skyrim, a(n) rpg game. Download for free. Ultimate Dragons is a mod for The Elder Scrolls V: Skyrim, created by tktk. This mod overhauls dragon combat which is not so unreasonable. Adds new 20+ animations and behaviors. And more new melee combat, new shout, falls down, enrages and locational damage. Aim to improve the actions, as well as balance is not so strong. No need to create a new game and wait respawn dragon when this mod installs. This mod adds new 20+ attacks animations. Adds new animations of the dragon attacks for the first time in the world, it is also a feature of this mod. Visual effect and attacks are depend on the type of dragon. Swing Breath: Fire or frost breath moves toward the right from the left. Tail swiping: Sweeping attack of the tail from the right or left side. Bite: Bite while spreading wings. Proximity meteor: Drop a meteor in four directions around the dragon. Location is fixed. Ranged meteor: Drop four meteors towards a target. Homing icicle: Icicles tracking a target. Ground blast:Explode at random in front of a target. Rock and steam come before it explode. Faas Ru Maar(Dismay):Fleeing NPC be affected by shouting. Player has no fear effect, but player staggers a little. Fus Ro Dah:NPC is knocked down by shouting. The player is no knock down, but stagger a little. Iiz Slen Nus:Freezes the NPC. Marked for Death:Armor are weakened for a limited period of time. Range is narrower than the other shout. High levels of dragons can use it. Summon Spectral Dragon:Summon two small snake-like dragons. Circle flames: Shoot the fireball in eight directions. Dragon doesn't fly more than other mods. Dragon is limited to target tracking performance while shouting. Dragon has taken a little longer preliminary movement before shout. Making it easy to take positions at reduced turning speed on the ground. Dragon considers position of a target to some extent, but basically attacks at random. The four different body part: head, wings and tail. When locational damage is accumulated certain level, dragon lies on the ground and reduce ability. Try to aim at the body part intensively as the situation demands. Durability is different by body part. You can take the alchemy of new material from a corpse if you succeed destroy tail or wings. It is useful against dragon. If you keep dragon irritating, he get violently angry with shouting. Dragon exhales smoke at the mouth during angry. Dragon increases speed of some actions and deal attack damage, and also incoming damage in exchange during angry. Dragon health has maximum three times by default. Dragon has maximum health and damage regist deponds on own or your level. Maximum health can be configured in MCM. Attacks damage or magic damage(included breath) can be configured in MCM. It is reinforced with magic via a script in order to avoid conflicts as much as possible. Reduce the impact on your PC as much as possible by using SKSE plugin. Please put "Ultimate Dragons.esp" under than other dragon mod in load order, because perk for dragon probably conflicts with other mod. I recommend you to set HP magnification to 1.0 if you use with other dragon mod. If dragon's health is 32767 and more, force health to 32760. Because it occur "no received damage" bug on this condition. Don't forget to install the scripts of “Data folder” of SKSE ! 1.Extract the downloaded archive to a temporary location. 2.Then move it to the Skyrim "Data" folder. 4.Activate the UltimateDragons.esp in your mod launcher by checking its box. Overwrite files. No need to make a clean save. 2.Must not be state of fighting the dragon before save game. 3.Exit game, and then removes this mod using all files. Can be configured in SkyUI MCM. Stagger Resist: Toggle option on to dragon has staggered resist. MeleeDamage:Set dragon deal melee damage multiplier before combat starts. MagicDamage:Set dragon deal magic and shout damage multiplier before combat starts. KillMove Rate: Set rate of killmove that player or NPC is killed by the dragon. Flying Rate:Set rate of frequency flying. Vanilla is the highest rate. Active Mod: Function stop of distribution script. Please turned off when uninstalling. If such has a problem to quest progression related to Dragon, try to off it before start quest. - Sometimes dragon cannot play additional animation. - Sometimes dragon cannot play effect in swing shout. 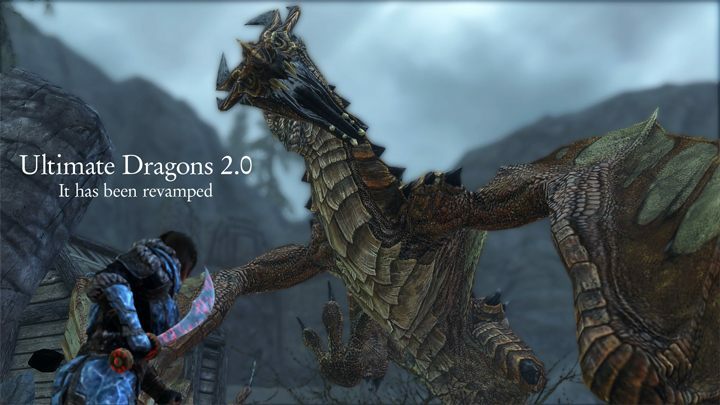 This mod is almost compatible with other Dragon mods. Chaos Dragons - UltimateDragons.esp should load after that esp. Dragon Combat Overhaul - Technically compatible with this mod, but sometimes irregular actions. No problem to game playing. Resilient Dragons - UltimateDragons.esp should load after that esp.